I would like to stress that the following exercises are based on my personal understanding and treating experiences from both the Western and Chinese medical point of view about lower back pain. I urge you to keep your mind open, study, and absorb other sources of information about back pain treatments. I would like to stress that the following exercises are based on my personal understanding and treating experiences from both the Western and Chinese medical point of view about lower back pain. I urge you to keep your mind open, study, and absorb other sources of information about back pain treatments. The more information you have, the more angles of seeing the same thing will help you analyze your problem more logically and wisely. After you have stretched your torso, next you should stretch your neck. The neck is the junction of the blood and Qi exchanging path between the head and the body. Whenever the neck is stiffened or the spine in the neck is injured, this blood and Qi exchange will be stagnant. Consequently, your brain will not have proper nourishment. Whenever the back is tense, the neck is also stiff and vice versa. Therefore, in order to maintain your health and relieve back tension, you must also learn the correct manner of loosening up the neck, including the muscles, tendons and ligaments. First, you should stretch the muscles and tendons around the neck and gradually reach to the ligaments, which are hidden deeply between the joints. To stretch the neck muscles and tendons, you should focus on the four biggest muscles/tendons located on the front and the back side of your neck. When you stretch your front neck muscles/tendons, you may turn your head backward diagonally while pressing your shoulder backward. Start the stretching gently for twenty seconds, then shift the stretching to the rear neck muscles/tendons. When you stretch your rear neck muscles/tendons, simply press your head downward and toward the side.Again, stretch for twenty seconds. After you have gone through the four sets of muscles/tendons, repeat from the beginning for another twenty seconds each. You should stretch each muscle/tendon group at least three times. This will provide good stimulation to the muscles/tendons through stretching. After you have stretched the four neck muscle/tendon groups, extend your head forward with the four muscle/tendon groups evenly stretched. To make the stretching more efficient, you may gently push both of your shoulders backward. The goal is to stretch the ligaments instead of the muscles and tendons. Stay in this stretching position for twenty seconds, then turn your head to your left slowly, and then to your right slowly. This will help you stretch and loosen up the ligaments in the neck. Repeat the turning two more times on each side. Finally, gently circle your head to one side on a small scale for about ten times, and then the other side for another ten times. You should not circle your neck to its extreme range of motion, since this may damage your cartilage and neck joints. This is a common cause of arthritis in the lower neck area in later life. Next, we will introduce two major Qigong exercises which can heal and rebuild the strength of the back. The first is a set of moving soft and soft-hard Qigong which developed from White Crane and Taijiquan martial styles. These exercises can be used effectively and efficiently for healing if you have already had a back pain problem. Generally, if you do these exercises twice a day, you should see some significant improvement in three months, and nearly complete healing in six months. The second set is a still hard Qigong which was developed in the Shaolin Temple. The training aims for the reconditioning and rebuilding of the strength and endurance of the muscles and tendons. Once your body has good support from strong torso muscles and tendons, the pressure on the vertebrae joints will be significantly reduced. It is commonly known that when the torso muscles and tendons are weak due to aging or lack of exercises, the pressure on the vertebrae joints will be increased. From this, you can see that when you do soft and soft-hard spinal Qigong, the exercises can reach deeply, and healing will be more internal. Once you have cured the problem, then you must build up a firm and strong physical torso. Spine sigh movement is very important to the back pain patient. This movement imitates the spine’s natural action when you make a sigh. Normally, when you are making a deep sigh, you are sick, sad or depressed. When this happens, your inhalation is longer than exhalation, and the Qi in your torso is more trapped inside, which can therefore cause your torso muscles and spine to become tenser. In addition, the Qi stagnation can also occur in the internal organs and result in sickness. Under these circumstances, instinctively you will inhale deeply while thrusting your chest out, and then push your pelvis out slightly to loosen the lower back. Finally, you make the sound of Hen and exhale naturally while continuing to move your spine like a wave upward into the upper body. From these repeated sighing movements, the tension of the torso can be eased and the internal organs can be more relaxed. In order to loosen the lower back when you have a pain, you should first be familiar with this spine sigh movement. To practice this movement, you place both your arms comfortably right in front of your chest. When you inhale, thrust your chest out while straightening up your torso (tailbone pushed forward) and then continue your inhalation while pushing your pelvis backward and gradually holding in your chest. 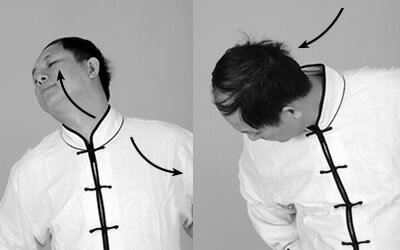 When this happens, the Mingmen (Gv-4) cavity on the back will be opened and the Qi in the front and the rear side of the torso will be balanced. Finally, release the carbon dioxide out and continue pushing the lower back backward to relax it. Mingmen is translated as “Life Door” in Chinese medicine, because it is understood that this is the gate which connects with the center of our life, the Real Lower Dan Tian (Zhen Xia Dan Tian). The Mingmen cavity is located between the 2nd and 3rd lumbar vertebrae. To release tension in the lower back, the first task is to relax and open this gate by gently and slightly pushing the pelvis backward. If you have already experienced back pain, you must learn how to move your pelvis correctly to relax the lower back area. When you do this correctly, you will feel the relaxation so deeply in the spine that it reaches the ligaments of the vertebrae. Remember, whenever you experience lower back pain or tightness, the first step is to repeat this spin sigh movement to loosen up the lower back. Qigong is not a drug but an exercise to rebuild the strength of your physical body. It takes both time and patience.